Problems seem to be created or born out of change. Change is inevitable. It’s happening all around us. Change creates various problems. I wish I could stay young, healthy and a size 14. Not gonna happen! Change has come more quickly than I expected along with problems. Institutions and organizations need persons who can take care of problems not continually point them out. I am finding too many of us in the church believe that complaining is a constructive act. Pointing out problems in the accusatory and blaming fashion provides little change, improvement or solution. Many times we point the finger and magnify the problem in hope and expectation that those in leadership can fix it. 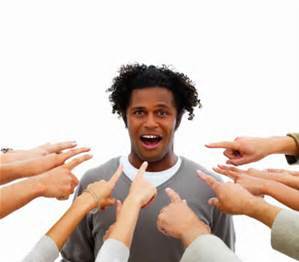 We get good at blaming others and yet contribute very little ourselves to improve things. We avoid personal responsibility and use all our energy pontificating and complaining. Besides finger pointing feels good. I’ve done it myself a time or two. We believe crying out, “You, you, you” gets us off the hook. Yet, it never brings about solutions. When we point a finger at someone else we forget the fingers that are pointing backwards. Finger pointing is a popular but dangerous activity. Have we expected too much from our institutions and leaders and too little of ourselves? Maybe the solutions are in those fingers pointing back to us! I hear Jesus saying, “how can you obsess about the speck in your neighbor’s eye and you cannot see the forest in your own eye (Matt.7:3)? There are some sobering truths I must admit to myself. Maybe I haven’t been the change I would like to see in the Church and the world. Maybe, I need to evaluate my skill levels and my willingness or lack thereof to do justice, love mercy and bring transformative change to the lives and communities I find myself. Maybe I need to care a little more deeply about the problems we are facing and do all in my power coupled with God’s power to bring healing. I have made a decision to put my hand down, stop expecting others to do what I have the power to do myself. I’ve decided to put my hand down get to work assuming some ownership of the problems I've encountered and do all I can to bring, healing, wholeness, love and unity. Besides the institution’s success is the accumulation of the people’s work results. Isn’t it? 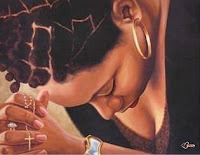 I have never considered myself a great prayer warrior. I have always yielded to those who I considered to be gifted in the art of conversation with the Holy. However, with so much division and frustration around me, I needed to write these words. God of many names, times and places as I bow my head in the locks of my shoulders, I come in humble adoration giving you thanks for the opportunity to call on your holy and righteous name. I come thanking you for you are always better to us than we deserve. I come full of angst and emotional turmoil because of the pain and dissention I see in our communities, churches, and across the world. I come before you feeling powerless to stop the hatred that divides races and nations. God of peace, right every wrong done to your people everywhere. Bring peace to those places where war has been a daily occurrence. Allow your light of peace to shine in those dark desolate places of pain and terror. Mother of the nations, protect your children everywhere who are homeless, cold, hungry, tired, hopeless, frightened, and looking for a safe loving place in order to live, thrive and be children. Give our political and religious leaders everywhere eyes of pity and a tender heart of compassion. Help them to see you in others so they will recognize our common humanity. Giver of Life, you have created all things and called them good. Make us good once again. Create in us clean hearts and renew a right spirit within. Touch our hearts right now and remove anything that would hold hurt, anger, grief, pain, jealousy, and resentment. Bend our pride to your control. Help us to celebrate our vast differences, gifts, graces, and use them to build a better world. Release a spirit of forgiveness in the atmosphere right now. Heal your human family. Make us one with brothers and sisters all over this world. God of love, bring peace to the land, by transforming all instruments of war and suffering into works of art and enjoyment. Destroy the violence and evil that so easily becomes us and give us hearts that lead us on paths of reconciliation. God of my ancestors, I pray that you strengthen me for the days ahead, to be a bold participant in the difficulties of the time. Help me to use my knowledge and wisdom to influence others to do justice and live righteously. May all that you are, become all we must be. In the mighty and matchless name of Jesus the Christ. This is my prayer. So be it.